Whangamata is an outdoor persons paradise . The stunning white sand ocean beach was voted best beach in New Zealand in 2018. It has fantastic surf for surfing and swimming and islands to walk to and explore at low tides a stones throw away. If fishing and diving is your thing the ocean offers all this and more. Two golf courses in the town cater for the novice and the enthusiast . A 9 hole course in town and a 18 hole course on the towns outskirts give you all the challenges you need for a golfing holiday at the beach. Surrounded by forestry and boasting lots of newly formed mountain bike tracks this is the place where you must bring your mountain bike. Wentworth Valley Waterfalls is a beautiful bush walk which attracts plenty of hikers each year to enjoy the stunning scenery and waterfalls. The sheltered harbour and estuary offers safe swimming or a place to learn to windsurf , water ski or paddle your stand up paddle board or canoe .If you forget your equipment or don't have it you can always hire it in town. The Whangamata Bar is a world class left hand surf break which has attracted surfers to the town since the 1960's. The accommodation listed is for the top level of this house. Downstairs is not occupied. It has 2 bedrooms, its own bathroom, lounge and kitchenette. An option for larger families or friends is to rent the bottom level as well. This is available and price is by negotiation. No pets and smoking allowed outside only. No parties. Plenty of off road parking for boat and double garage for security of car and surfboards . Magazines and information about the Coromandel coast. Thanks for a great break. A very clean and modern holiday home with everything you need for a relaxing time away. Situated close to beach and café for that morning coffee. Dave and Dale were friendly welcoming hosts who are right next door should you need them. A beautiful home very well appointed. Very helpful and friendly hosts. One little suggestion is maybe a couple more pots in the kitchen would be helpful. Thank you so much for a lovely time which was had by all.. Excellent guest. Easy to deal with. Left house spotless. Welcome back anytime. 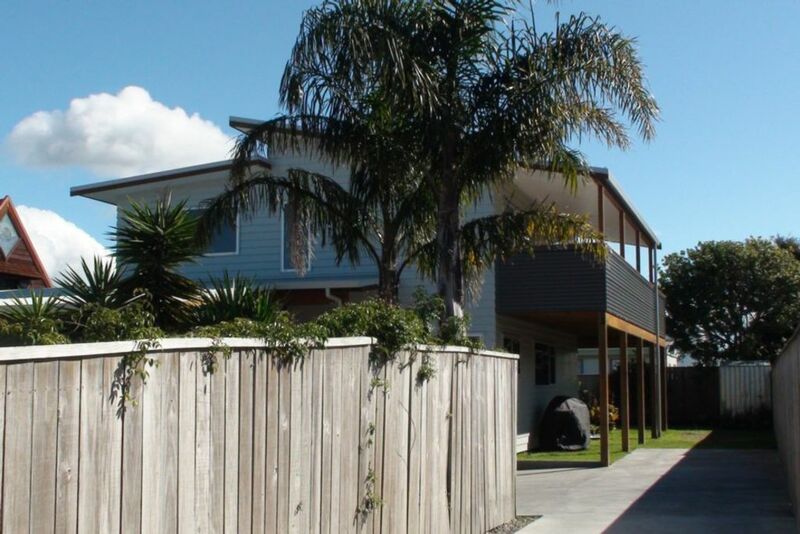 A modern, clean, tidy and relaxing home away from home in a great location - only a short walk to the beach. Friendly/helpful hosts. This wasn't our first stay here and we hope to be back again someday. Excellent guest. Always a pleasure to deal with. Left house spotless. Welcome back anytime. Great location and very modern and comfortable home to spend a relaxing couple of weeks in.